aka The Good, The Bad, The Ugly. • The Good: I PR'd by just 1 second shy of 6 full minutes. • The Bad: My bike leg was a bit slower than I had hoped (in large part due to steady wind with some strong gusts) and my 2rd running leg was a minute slower than last year. • The Ugly: Friggin' foot and calf cramps...the same sort of cramps that ended my short (3 race) marathon career. I still consider this a "good" race. I learned things that I will use as I start training for a duathlon in July and things I will use when I hopefully compete for the 3rd time in this event next year (assuming that it's not the same weekend as the Flying Pig Marathon/Half, which I am planning to do with the same gang of girlfriends whom I met out in Vegas this past Dec.). In no particular order, the things I will do differently the next time around include: going back to the Gale Bernhardt training plan (adapted to my life, somewhat) that I used for last year's race. The training plan I used this Spring was similar in mileage, but a good deal more aggressive...to the point where hard/quality workouts made up at least half of my mileage some weeks...which is a good deal more than most experienced racers/coaches will recommend. There were weeks where I was lucky to have more than 2 easy/recovery workouts out of 7-10 workouts/week, including weight workouts. In addition to this I was frequently going for weeks without a single complete rest day. By the last month of training I was feeling burned-out much of the time. So it was no surprise when 5 days prior to the race I caught my son's cold. Luckily it was mostly a sore throat and pretty significant body aches and general malaise--no serious sinus or lung issues, which could have very well spelled DNS. It was just as well, perhaps, since this plan also had minimal taper and illness forced me into quick-and-dirty taper mode. I now realize that I should have adapted the plan to what I know has worked for me in the past--weeks before race day--once the exhaustion issues set-in. Less than a week of taper is really not sufficient for a race of >2 hours. I wouldn't do less than 10 days for a half-marathon or 25k, and that is how I should view taper for a sprint duathlon, as well. Next time I will also forego the full bottle of wine 2 nights before the race (seriously, what was I thinking? DH brought home one of those double-sized bottles of wine with the "theory" that we would drink half 1 night and then the rest on another occasion. Right. Problem with that idea is that after a half bottle it's very easy in that tipsy state to justify just finishing the bottle, which is what we did. Also it was nice to have my nerves calmed by the wine AND I was feeling much recovered from the cold, so there were extra bits of justification thrown-in). Needless to say, that wine did me no favors. I didn't sleep well after over-imbibing and was certainly a bit dehydrated to start the race, even though I did my best to guzzle extra fluids the day before. And this is likely where the cramps came in. I'm sure it didn't help matters that we had a warm day; at least relative to what we've become acclimated to this Spring, which is generally cold, wet, dreary, and windy. Low 60s was still a bit of a shock to the system. Even during my 1 mile warm-up jog I was uncomfortably warm. During my first 5k (which I PRd by ONE second) I was feeling off...I had those chills that normally don't seem to present themselves unless the temps are MUCH warmer. That first running leg just felt off from the first step, though. Last year I felt SO much stronger from the get-go. First transition this year was over 30 seconds faster than last year, though last year required adding a long-sleeved top and tights over my tri-shorts, since it was in the low 40s and raining (last year's weather actually made for MUCH better runs...I will never complain about running in the 40s). 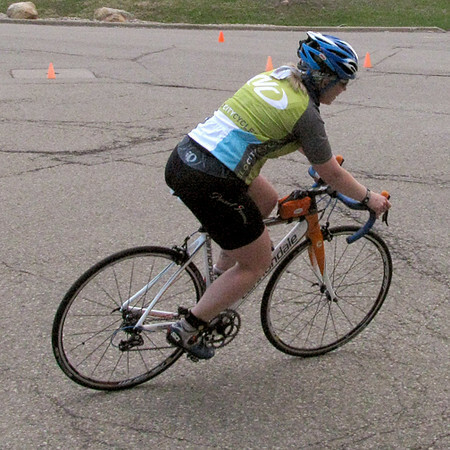 The bike leg went better this year than last, aside from the wind (at least until the cramps started). Last year the pouring rain and wind were a bit hairy on the bike. That was the first time that I'd ever ridden in such weather. I was cold, wet, and terrified, especially around corners. This year I also passed more people than passed me. Last year I'm not sure if I passed anyone. Last year my average pace was 15mph, this year was 16.5mph. I cut almost exactly 6:30 off of my bike leg vs. last year. I'm pretty pleased with that. A few miles after the turn-around my right foot started cramping, and it took my calf with it. Part of this is certainly due to effort and dehydration, but my overly narrow shoes (I need at least a D width and my shoes are a relatively narrow standard women's B) were certainly no help. They've not fit well in the nearly 18 months that I've been riding. About a week ago I ordered a new pair of shoes (this time a pair of men's D-width shoes), but they had not arrived by race day...and I probably wouldn't have risked wearing them, even if they had--nothing new on race day. The cramps were very much like my marathon cramps. Not just pain, but such strong muscle spasms that my foot would be jerked into a painful point. This made pedaling difficult, of course. Upon finishing my bike leg I headed to transition, got my shoes off, then suddenly couldn't get my right running shoe on my foot as my foot was uncontrollably forced into a point by my calf muscle. It took a few seconds before the contraction ended and I could get my shoe on. This added an extra 10-15 seconds or so to my transition time, I believe. I was pretty terrified for the duration of the cramp, though. For a few seconds I was certain that I'd have no choice but to take a DNF. The remaining 3.1 miles were pretty much a death march. I was afraid to push my pace at all, since my memory of my marathons and cramping were that of only being able to keep cramps at bay by walking or cutting back on my speed significantly. So this year's final 5k run was at 9:22, vs. last year's 9:03 for the last running leg. Without the cramps I very likely would have snagged 3rd place in my age group (my pokey transition times didn't help matters...I really need to work on that for my next race, as well), but I was happy to see my friend, "Kaat," take it. Last year I beat her by a measly 17 seconds, so it was her turn to put me in my place. It was still fun that she and I were piggybacked in the race results 2 years running. Neither year was there a single competitor in the entire field between us. This year we even had matching jerseys to represent our favorite bike shop (we are also JDRF ride team teammates). My overall #s were 61/96 total racers, 14/36 women (that's both 14th overall AND 14th on the bike...not sure if that's significant, but it's funny, since my race # was also 14...fate). 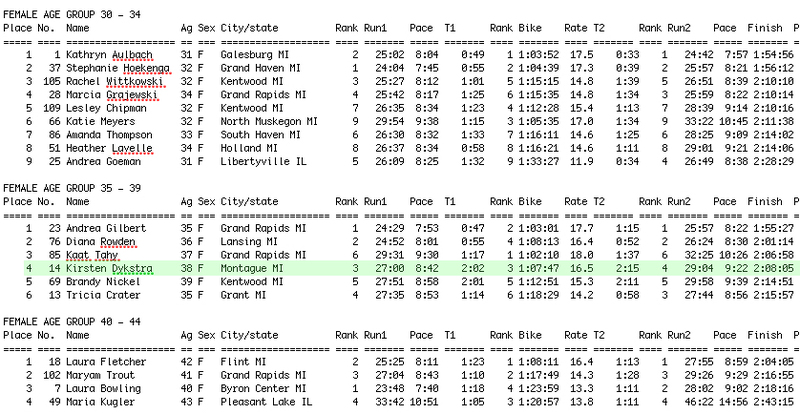 I find it interesting that my time would have bought me podium spots in the age groups younger and older than my own. Clearly I'm the wrong age! Next year I look forward to applying the lessons learned this year to the same race. It's really nice seeing big PRs every year. I hope I can cut a few more minutes off the next time I tackle this event.